I Just finished upgrading my Jockey Box (post to come soon) and I deserve a beer, but I wanted something different tonight. I’ve indulged in a ton of IPA’s over the last week since my Buddy Jake sent me a huge box of goodies from the Midwest. 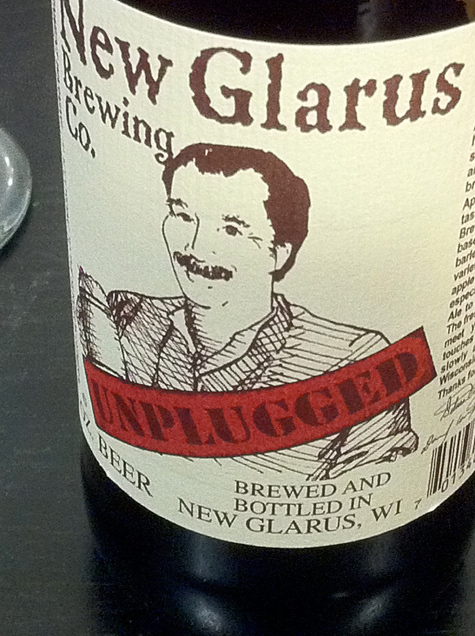 Tucked away in this box of ridiculously twisted IPA’s there was a lone bottle of New Glarus’s Unplugged Apple Ale. Apple Ale? What to expect from that. I’d never even heard of this beer, I suppose I could go an look it up on Rate Beer, get some details on the beer and see what all the other geeks thought of it. That’s not me; if it looks interesting I’ll try it. You all should know by now that I don’t care about style, just how it smells and tastes. If I were to wager a guess on what I was getting, I would have thought some funky apple juice tasting beer. I was right on two counts. It’s a beer and taste like an unfiltered natural apple juice. It’s actually really good, a yeasty apple juice and the nose is that of an apple Jolly Rancher. It super refreshing, while initially tasting sweet finishes really dry. I keep finding my self reaching for another sip as soon as I put the glass down from the previous sip. 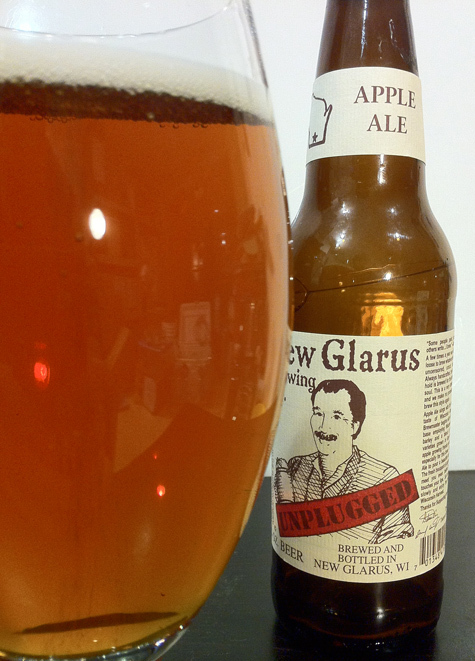 Another successful unplugged beer from New Glarus, in my humble opinion. I still want some of that Unplugged Smoked Rye… must find some! Hope you like the photos, I used my cell phone, They came out much better than expected! You know who’s got 2 extra bottles of Unplugged Smoke Rye Ale? This Guy! 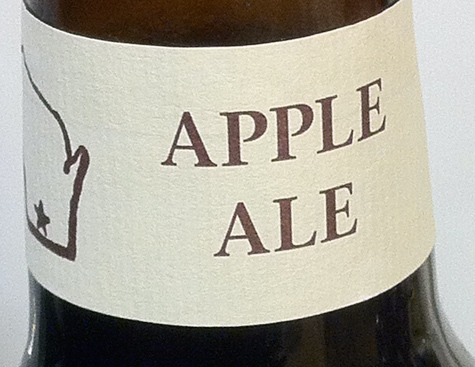 The Apple Ale sounds very interesting and admittedly surprising. Kudos to Dan Carey (the owner/brewer) for just having the balls to brew an apple ale. Most brewers would not do an apple beer. Apple flavors are often associated with flawed brew(acetaldehyde). Tweaking the beer police is the norm for NG. The fact that Apple Ale is good doesn’t surprise me either. 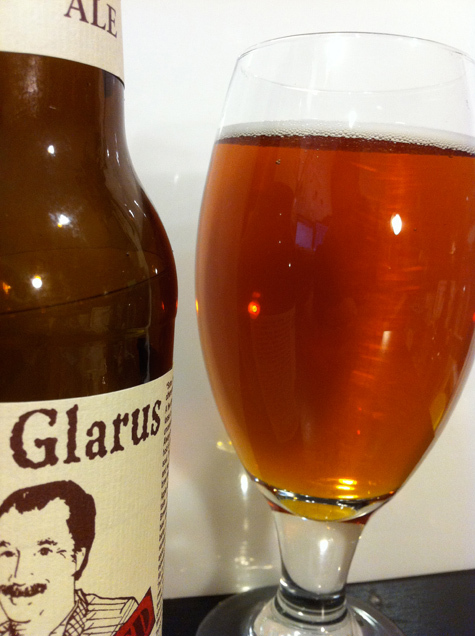 New Glarus has so many great beers: (most) of the unplugged series, spotted cow, fat squirrel, dancing man wheat, road slush, yokkle, black wheat…. Alas, the last I heard NG does not ever plan on distributing outside of Wisconsin. Jason, I’m going to hit you up for them! 🙂 I’ll email you. Scott, Great point. I never once thought about that off flavor with this beer since it really is an apple juice flavor not a granny smith flavor. Also to Jason’s point on facebook, those Wisconsin’ers seem to be able to consume enough NG to keep them local only. Good for them, bad for us! If you get a chance try it out.